Ideal way to carry water for picnics, camping and other trips. Bladder design almost eliminates water sloshing noise when carried inside vehicle. 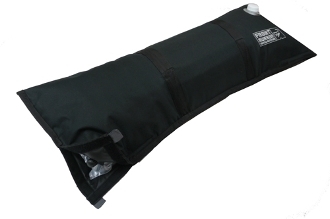 Heavy duty, double layer, padded canvas bag, with triple stitched enforced seams and reinforced fill spout. Two carry handles are sewn into the case making for easy transport for filling or to the campsite etc. Folds flat when not needed to reduce storage space. A "wine cask" style tap/drain is fitted and is protected inside a velcro pouch at one end of the bladder. Bladder lining is food grade with no taste. Includes: Canvas bag, 1 liner.